Stop me if you’ve heard this one before: a troubled, angsty teen gets in trouble and is sent off to live with their dad in middle-of-nowhere, USA. Once there, the teen develops an independent identity, meets a sparkly vampire, and Indian werewolf…ok, that last part might be inaccurate, but you get the idea. Bravetown doesn’t provide anything you haven’t seen in dozens of other movies, what sets it apart, however, is that it manages to rip off its predecessors in the most bland way possible. With elements of Step Up, Pitch Perfect, Twilight, Bring It On, and Good Will Hunting you’d think this would be a recipe for box office perfection. Unfortunately, someone forgot to tell them that when you make a movie, even one as formulaic as this, you still need actors that can, you know, act and a story that has focus and resembles something interesting. 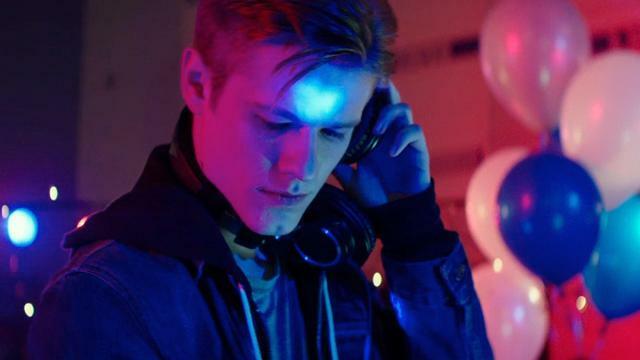 We begin with the hilariously overage “teenager” Josh, played by 25 year-old Lucas Till. The idea of casting older people to play younger roles is not anything new. Movies have been doing that since they realized that most young people can’t act. But typically, if you are going to cast someone in their 20’s to play a teenager, you should at least make sure they look like a teenager. I had the feeling he was actually older than most of the adults in the film. Anyway, Josh is a talented teen DJ who apparently has a gig as a major club DJ (which I would think breaks all sorts of laws). He spins tables, dances, makes out with the girls, and takes all sorts of drugs – no questions asked. Oddly enough, this causes him to overdose. After having his stomach pumped at the hospital, his mother appears out of nowhere to remind us how much trouble he’s in and how hard it’s been for her to be so “nurturing” to him (despite the fact that this is the first time she’s even seen or mentioned in the film). He is sent to live with his father and take some court-ordered therapy with the most “totally hip” and “with it” therapist, played by Josh Duhamel. After a chance encounter at a school function enables him to show the student body his musical talent, he is instantly elevated to super teen stardom. He catches the attention of Mary, the cute girl in school (who is just as edgy and misunderstood), and as a result, her jealous steroid-filled junkie boyfriend. You know where this is going. The rest is history. To their credit, the two main characters, Josh and Alex (the therapist), are both performed with a convincing competence. They have a bond that is actually entertaining, but the subject matter is so stale and unoriginal, that they might as well have been reading the dictionary with gusto. The production value is that of a made-for-television Lifetime movie, which in itself wouldn’t be a problem with a film of this nature, but considering how stale the story was, it made the lack of budget much more noticeable as your eyes wander around the screen out of sheer boredom. Something else that doesn’t make much sense is the film’s MPAA rating. This is the most PG-13 rated R film I have ever seen. Aside from the occasional curse word and drug use in the first few minutes, the rest of the film was rather tame. Aside from a few pill popping scenes, there isn’t anything in this film that you wouldn’t find in any PG-13 movie. All this aside, the real problem with this film is the story. A rather awkward story arc occurs with the inclusion of “the war”. There is no clarification about which war (until the last 20 minutes), or why this particular town seems to have an amazingly large abundance of soldiers. But it does seem to be a major concern to everyone in the town, and a sore subject that isn’t really developed until the big reveal in the last 20 minutes. As a result, the numerous shots in the soldier graveyard were rather disconcerting. A town searching for identity is rather apropos considering this film felt as if it too was searching for identity. It already felt like a hodgepodge of different films glued together. But to make matters worse, it couldn’t decide what direction to take for its focus. Every conversation seemed to revolve around either dancing, music, “the war”, or fate. Between Josh’s struggle to fit in and find purpose, the town’s struggle to find their identity, Josh’s struggle to grow his talent, and the gloom of war, it became difficult to figure out what to pay attention to. It should also be noted that a massively wasted opportunity is had by underutilizing the talents of Laura Dern as the single mother of Mary who is suffering from depression. Had she had more screen and story time, this film may have had a better chance at being successful. Casting Laura Dern and Josh Duhamel into the two most significant roles of the film was a great casting choice, but instead of making them the focal point, they are relegated to supporting roles behind far inferior characters and actors. This film was brought to you by the letter B, as in Beats by Dre – which apparently funded this entire film with the promise that their product would be in every single shot. This entry was posted on Friday, May 8th, 2015 at 10:13 am	and is filed under Film, News. You can follow any responses to this entry through the RSS 2.0 feed. You can skip to the end and leave a response. Pinging is currently not allowed. « FILM REVIEW: ‘THE D TRAIN’! Mod fx... squared... dx. So please finish Parceval, by next time. I know many of you had this as undergraduates, but it won't hurt to brush up.